Chanterelles are a dense and meaty, edible, wild mushrooms ranging in color from orange to gold. They have wavy, fleshy caps ( ranging from 1-6 inches across)with ruffled false gills that flare upward along the stem forming an abstract tulip. Their flavor is nutty, emitting savory aromatics, especially when cooked. Entirely edible, the stem is chewier and more fibrous than the cap. To clean Chanterelles, and almost all other mushrooms, use a clean, damp towel, and gently brush away the dirt and stems. Do not store mushrooms in a sealed plastic bag or plastic wrap, they will sweat and rot quickly. 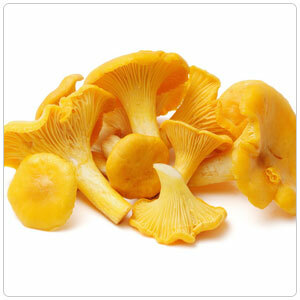 Chanterelles will last several days in the refrigerator if kept in a well circulated area. Mushrooms are a huge group of edible fungi that are grown, picked and eaten in almost every country around the world. Mushrooms come to us as cultivated, grown in some manner by man, or, as wild, originating in wooded forests. Interestingly enough, cultivated mushrooms do not grow in the wild and wild mushrooms have yet to be successfully cultivated by man. Impervious to cultivation, chanterelles do not survive or reproduce outside of the forest.